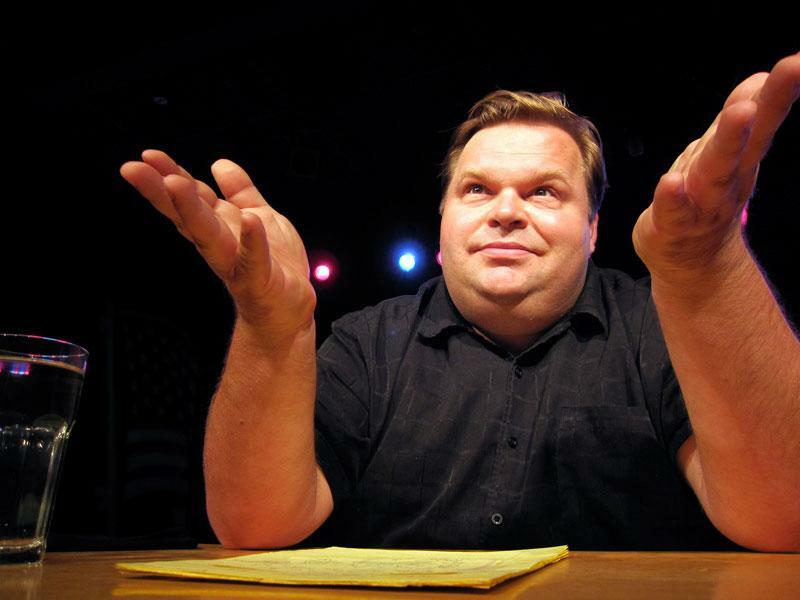 Following an exposé that dismantled the accuracy of his claims regarding workers' conditions among the manufacturers in China Apple uses to build its products, performer Mike Daisey has offered a new, broader apology. Writing on the subject of getting the facts right when telling stories, Daisey acknowledged in his blog, "I fell short in The Agony and the Ecstasy of Steve Jobs." Daisy added, "when I said onstage that I had personally experienced things I in fact did not, I failed to honor the contract Id established with my audiences over many years and many shows. In doing so, I not only violated their trust, I also made worse art." He concluded, "I am sorry for where I have failed. I will look closer, be more patient, and listen more clearly. I will be humble before the work." Things came out of my mouth that just werent true, and over time, I couldnt even hear the difference myself," and apologized to "human rights advocates and those who have been doing the hard work of bringing attention to these kinds of labor issues for years," he didn't offer any apologies to the actual target of his lies and exaggerations. Beyond the plausible-sounding events Daisey falsely claimed to observe as an eyewitness, he also stated to various media sources that Apple, and the company's then chief executive Steve Jobs, were fully aware of the events but refused to take any action because they didn't care about what was going on in China. In the context of his false story about meeting many workers who were 12 to 14 years old, Daisey rhetorically asked "Do you really think Apple doesnt know? In a company obsessed with the details, with the aluminum being milled just so, with the glass being fitted perfectly into the case, do you really think its credible that they dont know?" Daisey's monologue has played for over a year, creating and pushing momentum behind a story that was picked up by a wide variety of media outlets, despite Apple's efforts to transparently and accurately report was what actually occurring in China, and detailing what actions it was taking to stop problems it discovered in its regular audits dating back to 2006. It was only over the past two weeks that his story began to unravel, when radio show "This American Life" retracted its episode on Apple after investigating Daisey's claims. When the translator Daisey had worked with to obtain reports of child employees, workers crippled by hexane, and threatening armed security guards was identified by investigators, she testified that the stories Daisey told were fictional fabrications. Right up until his work was outed as a series of exaggerations and lies, Daisey continued to insist that his play was factually accurate and based on his real world observations, complaining to skeptical critic Brian Ford, "You insulted my art form and my work, at length, without knowing what it is, proud of how ignorant you are, and your sneering and contempt say a lot more about your worth than I ever could. You insulted my integrity, and in a better world we should settle this in an alley outside a bar of your choice the next time I'm in Kansas City." Despite his apologies to audiences, the theater, journalists and human rights workers, Daisey is still unapologetically selling tickets to his show.